As I type this, I'm sitting on the slowest moving train known to man (I could seriously run faster, ya'll), on the last leg of my three-week sabbatical home. Looks like that layoff was some damned good timing, since I ended up having to chauffeur my parents up and down the east coast for my dad's eye surgery. First the surgery, then the week-after follow-up. And, in another two weeks another follow-up roadtrip. Whew. I Tweeted it, but dang, did I make the 85/95 corridor my bitka! 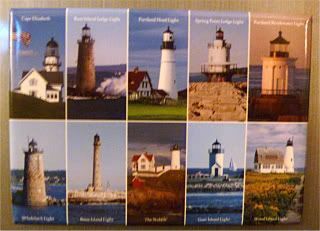 I picked up this magnet at a Hannaford's in York, Maine, when it was becoming clear that I wouldn't be able to see any lighthouses of Maine. In fact, I'd mentally written up the whole lighthouse magnetpost to be how of course I went to Maine and didn't see a lighthouse. The next morning, though, we decided to take a quick oceanside jaunt, and just before a fabulous breakfast at Sandy's Purple Palace, we stumbled to Nubble Lighthouse. It's on an island, next to a look-out promontory - so gorgeous. Hurricane Earl helped us out with a strong surf, so it was very cool to see it with busy waves hitting the shores. The lighthouse and its outerbuildings were very much like a Hopper painting and I couldn't stop taking pictures, just trying to capture the right shadows of the towers on the lawn. Or, you know, waiting for the gift shop to open. I have this strange urge to see Pete's Dragon now. And I haven't been able to stop singing It's Not Easy or Candle on the Water, ever since. And I can't stop trying to say Passamaquaddy, either. You've been everywhere. Man. Seriously, what a wild ride! Yeah, and I still have to do another trip. It was hard on the parents, though. I wish they'd just fly, but the open road, she calls to them. I like it, cuz whenever I drive, I make sure to listen to whatever I want to. Which makes them crazy, but they put up with it. Loudly. Heh.